The brightest colored paper available. Guaranteed performance in laser and ink jet printers. 8-1/2 x 11 acid-free sheets. Durable, heavyweight, 65-lb. cover. Ideal for color-coding, menus, posters and more. 250 sheets per pack. 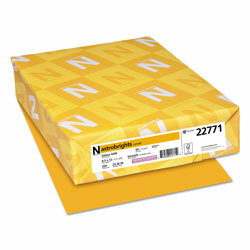 Letter Size Gold Color Paper from Wausau Papers! 493 In Stock today.